I am delighted to give you the chance to win one of 20 signed FAG paperbacks. The competition is free to enter on Goodreads and all residents of the UK, US and Canada have until the end of November to register their entry. To find out more about the book, please visit the official site. Readers should note that FAG contains adult themes, strong language and scenes of a sexual nature. When I wrote the very first words of what I hoped might become a novel, I had little idea of plot or characters. I had only in mind a teacher and a pupil - Gray and Thompson - and I knew not what would happen other than that I was going to put them through unimaginable hell. The words came thick and fast and before I knew it I had written a chapter. And another. And another. The story seemed to write itself at times. The characters were evolving and propelling the plot forward faster than I could write. For the first time in my writing career, I reached no dead ends, experienced no dreaded writer's block. At one point, I wrote ten thousand words in a single day; I could have written more, but for the sake of my sanity I forced myself to stop. During key scenes in the novel, I'd write with my heart pounding and hands sweating, furious at the characters I'd written. How could such monsters exist? And yet they do. How could they treat fellow human beings in this way? And yet, in real life, sadly they do. I'd finish passages mentally and emotionally drained. Something was happening. And not just in the book. The book was becoming more than just a story, more than just a means of entertainment. It was not long before the bongs of Big Ben signalled the arrival of 2014 that I told a very close friend something about who I am. Something so important and integral, yet something which I'd hidden my entire life. The relief I experienced, along with emotions not done justice by the term 'roller coaster', is something only those who have undergone a similar rite of passage can understand. The following days saw me experiencing highs and lows I'd not thought possible. I was, to put it bluntly, an emotional wreck. I could no longer continue the book I had named 'FAG' before anyone actually knew the real me. I could not invest any more mental energy in these characters wrestling with their own sexualities and fighting to survive in a school that I believe is all the more frightening because it is not far-fetched. It has happened. Is still happening today. Not precisely the same plot necessarily, but the terrors that the book's characters face are by no means restricted to fiction. I returned to the book sooner than I thought I would. The story had to continue. I had to tell it. I had to drive the characters into Hell for them to have any chance of coming out the other side. Do they come out the other side? Well, that would be telling; you'll have to read the book for yourself. Readers have described the book as devastating, gripping and harrowing. I have never made out that FAG is an easy read. It isn't. It's brutal, unflinching and honest. To write anything less would be to do a disservice to all those who have suffered and continue to suffer, surrounded by bullying, oppression and prejudice. To my knowledge, thus far, only one reader has not finished the book, unable to bear reading on. It's rare that a writer sees a reader not finishing his book as a compliment, but I do. I now know I have written something powerful enough. And those who have reached the novel's end? I feel so fortunate that they have felt the journey worth it. Despite the pause during the writing of the first draft, I finished it in a little over two weeks, something I never expect to achieve again. Over the following months came several edits, all the time honing, cutting and adding to satiate the perfectionist in me. I strongly considered publishing the book under a pen name. How on earth could the author of the light-hearted Maureen books be seen to be publishing something so daring, so... adult? What if fans of Maureen bought a copy expecting something along the same lines? As one reviewer pointed out, this is most certainly not Maureen Goes to Boarding School! Furthermore, or principally (I realised on reflection), if I published FAG under my own name, everyone would soon know the real me. And therein I had my answer. I would not be the hypocrite who, using a pseudonym, wrote the novel about oppression and the tragedy that can arise from lies and dishonesty. No, I simply had to publish under my name. Because if I didn't, it would undermine the whole point of the book. I decided to market the book so as not to mislead readers of my earlier work. The cover's imagery is dark, the writing of the title stark. The book has its own website to keep it separate. The blurb mentions the adult content. There is language you won't and will never find in the Maureen books. There are scenes which are disturbing and sexually graphic (and have to be). Nothing about this book, I hope, gives the impression of something light-hearted and frothy. The publishing of the book in May 2014 marked something of a milestone in my life. I nervously awaited feedback, the first thoughts and reactions to something so different from a writer people thought they knew. I mentally prepared for hostile reactions and, worse, rejection. The title itself, a deliberate play on words, caused some offence upon publication. To this day, I have not once doubted the suitability of the title. Several months after publication, a reader from the US (where the word 'fag' is considered highly offensive, more so than in the UK) wrote in his review that the title could not be anything else; it had to be FAG. I cannot describe how wonderful this was to hear. 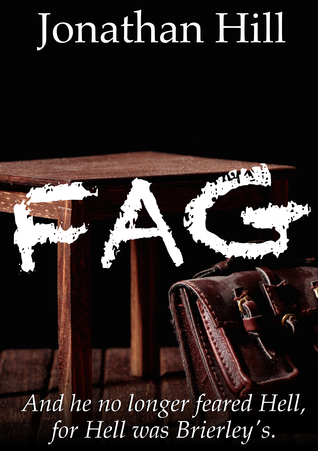 Unfortunately, despite allowing the title through its unfathomable web, Amazon includes 'fag' in its blocked words list, which means that readers can discuss the book on its forums only with great difficulty and reviewers are unable to review the book with any reference to the title. I understand the reasoning behind Amazon's decision but am continuously frustrated by it. I have published a book I never thought I could have written and now someone is trying to censor it. Such is life. The reviews continued to roll in, endorsing the book's message and praising its content, and FAG is now my most consistently selling book. I'm eternally grateful to friends, family and readers who have trusted me enough to pick up the book and read it and accept me for who I am. This blog post signifies the end of the FAG journey (unless some kind director wishes to film the book?) and I am pleased to announce the release of the paperback. This is the second edition of the novel (now also live on Kindle), the last edit introducing some minor changes including modifications of some of the strong language and several very minor plot additions which enrich the story but do not affect it. Readers of the first edition can rest assured that they have read a version as near to complete as it needs to be. The second edition could more accurately be called the perfectionist or OCD edition! The book is of course still available on Kindle, but if you wish to purchase a copy of the paperback, you can do so through Amazon UK (Amazon US) or directly through me, should you wish for your copy to be signed (with or without dedication).